Despite weather forecasts indicating that an early rise might have been a wasted one, a few CNY amateur astronomers braved the 4 a.m. skies and temperatures in hopes of watching our Moon all but disappear from most of the visible light spectrum. The total lunar eclipse on the morning of October 8th marked the second eclipse of the year (with the first occurring on a washed out April 15th) and the second in a series of four (known as a tetrad) that will complete with two more total eclipses on April 4th and September 28th of 2015. Those keeping track of the local eclipse news will very likely have found Glenn Coin’s (at syracuse.com, twitter: @glenncoin) two reports (“Will full lunar eclipse…” and “To see total lunar eclipse…“) about the eclipse and the potential for us in CNY to see it, with the second article featuring a few snippets from myself and Bob Piekiel. 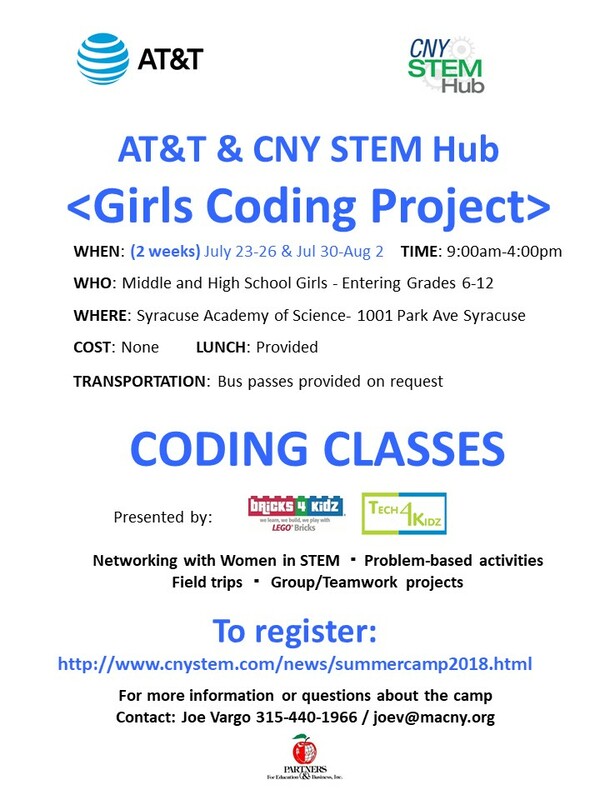 Our continued thanks to Glenn for keeping astronomical phenomena appearing on the syracuse.com website! 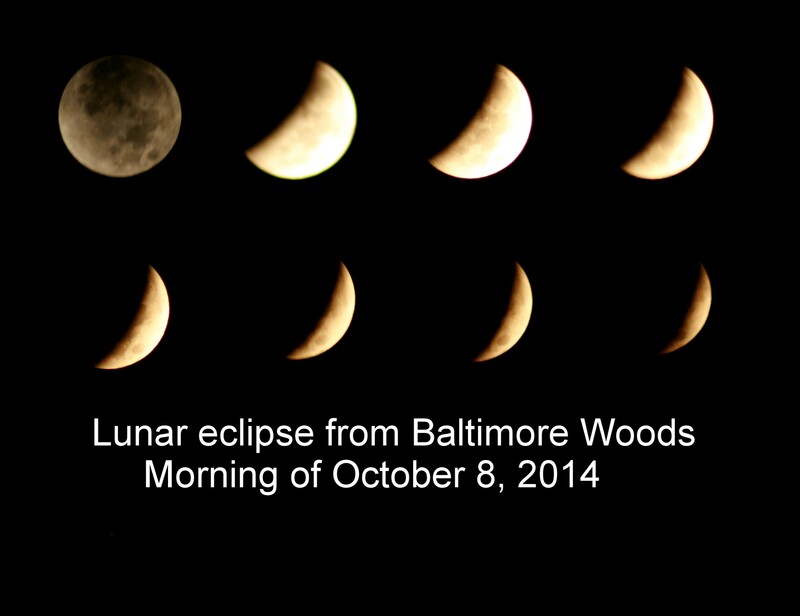 The lunar eclipse from Baltimore Woods. Click for a larger view. We had a crystal-clear break in the clouds for nearly an hour on Wednesday morning, enough to get some good views of the eclipsed Moon, as well as Jupiter, and some amazing views of M42 as the sky darkened with the setting Moon. The Moon’s covered area did indeed turn a bright red, noticeable even as the twilight approached, right up until we lost sight of it in some low clouds above the tree line. My part of the lunar eclipse viewing was performed from my downtown rooftop. Unlike much of what we observe in the Night Sky, lunar eclipses are good from anywhere regardless of the amount of light pollution. I watched Bob’s clearing float East (the view at 4:20 a.m. Around the Moon as as perfect as one could hope for), then watched the Moon become consumed, then caught just enough of an opening to take the three images below. 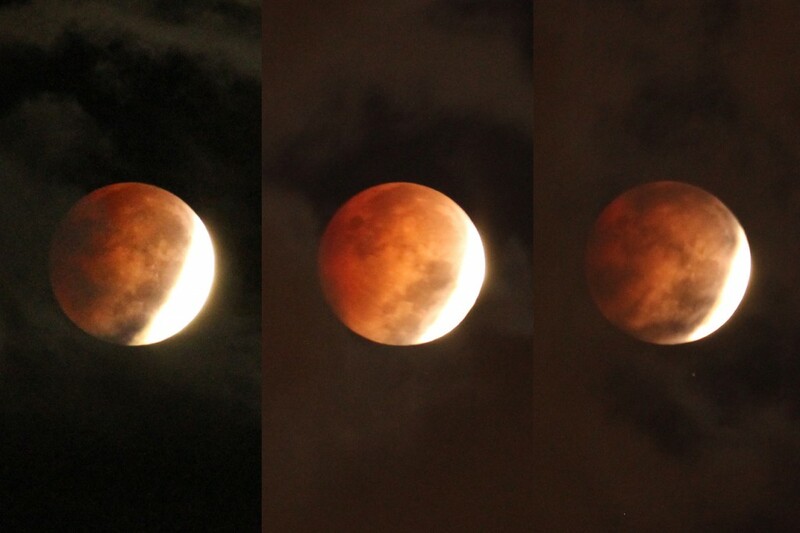 The progressing lunar eclipse. Click for a larger view. With the camera still out and the view above me clear, I also decided to grab a quick view of Orion’s Belt and M42 (this with just a 5 second exposure – and still from downtown). 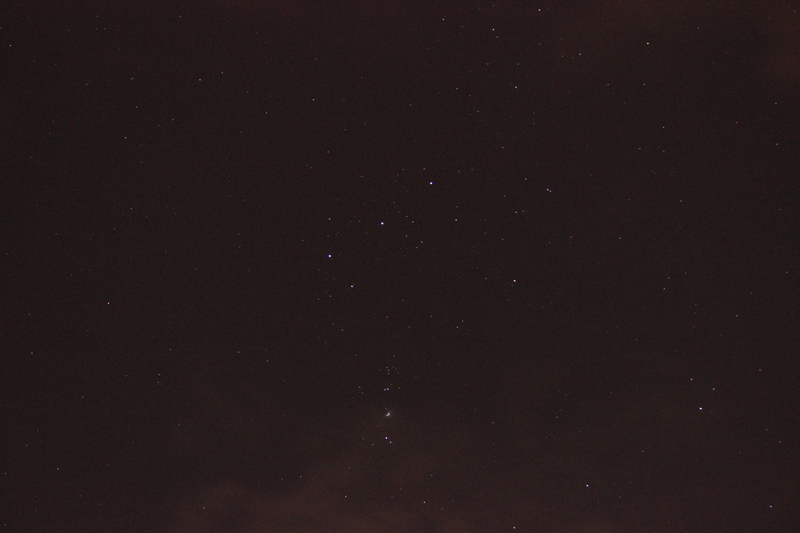 Orion’s Belt and the Orion Nebula (M42). Click for a larger view. With only a short window of observing to be had, the early wake-up call was well worth it (one surprise clearing is worth about two cups of coffee). With the eclipse image above and the standard CNYO presentation gear in tow, the astronomy morning ended at the Syracuse Academy of Science for their 8th Annual College & Career Fair, with over 100 students stopping at the booth to hold a piece of Mars, learn why Polaris doesn’t move in the sky, and grab all of our social media info to attend an upcoming CNYO observing session. From the booth at the Syracuse Academy of Science. Click for a larger view.